Geometry has become the latest wave of abstract art to overtake the Oakland art scene. This summer, several galleries are exhibiting shows ranging from contemplative poetic geometries to sharp and mechanical op art. Of these, the new, unassuming paintings by Alicia McCarthy at Johansson Projects are outstanding. In this new, mixed-media series on found wooden panels, she transforms her temperate punk symbols into a new, formal language. McCarthy has been painting in Oakland since the 1990s as an integrative part of the Mission School Tradition. She has had six solo shows with Jack Hanley in San Francisco, Los Angeles and New York, where she exhibited punk-painting installations. In her recent project she maintains her spontaneous aesthetic of vivid colors, while arresting them in geometric grids. However, her lines are not perfectly rigid, as they are drawn by hand, without the aid of any guidance tools or rulers. Even McCarthy’s black and white pieces release an iridescent glow that suggests a vivacious undertone. 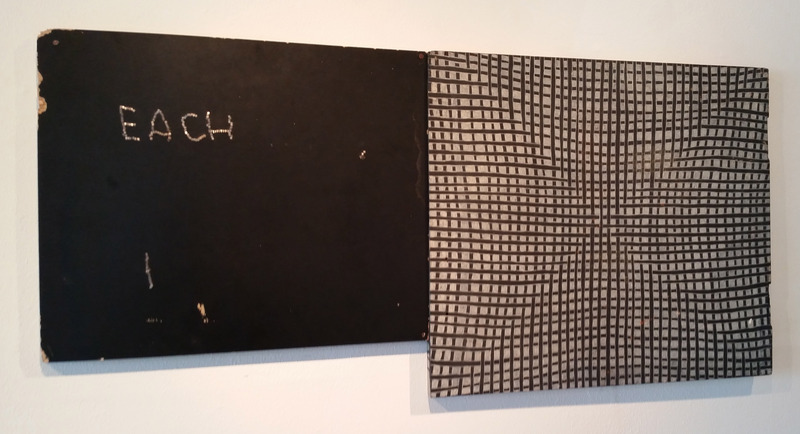 In the first – Untitled (1) – two stylistically different panels hang adjacent to each other. The left-hand panel displays a single word, which pops out against a dark background. The second panel displays a painted latticework, which suggests a carefully worked, woven structure. The striking presentation of a calligraphic text besides the separate image of an obviously hand-made pattern extends the work beyond the Mission School aesthetic into a wider, art-historical context, evoking the form of ancient manuscripts. In other works, McCarthy confines her patterns to partial areas of the panels. This constriction turns the patterned sections into awkward objects that stand out from the simple ground. 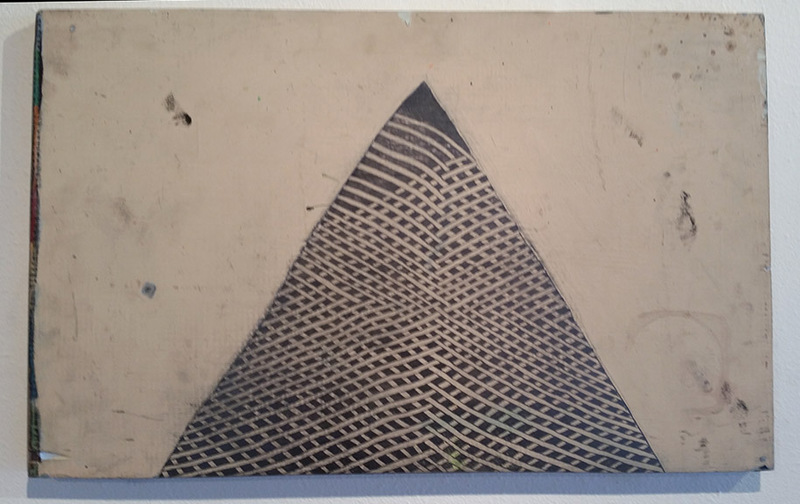 The object in Untitled (2) is a strange, checkered pattern, corralled by a lopsided triangle at the panel’s center. In Outside/Inside, McCarthy creates a similar oddity, drawing in pencil and house paint a hive constructed from piled rectangular cells. Most of the panel, however, is left empty, resulting in a strange architecture that appears to grow from the bottom edge in a geometric mass of neatly arranged cells against a rich, greenish background. The magic in McCarthy’s new works lies in their suspension between the scientific and the handmade. These original pieces show an artist mediating between these two poles. By using her grid as a direction rather than a constraint, her slightly meandering but confident contours become organic and genuine while maintaining the purpose of creating geometries. With her approximated straight lines, she redirects her gentle punk and gives it new frame and formal content. Among the many abstract-geometrical interpretations now on exhibit in Oakland, McCarthy’s contemplative shapes stand out in the handcrafted and irregular layouts of their invented geometries. 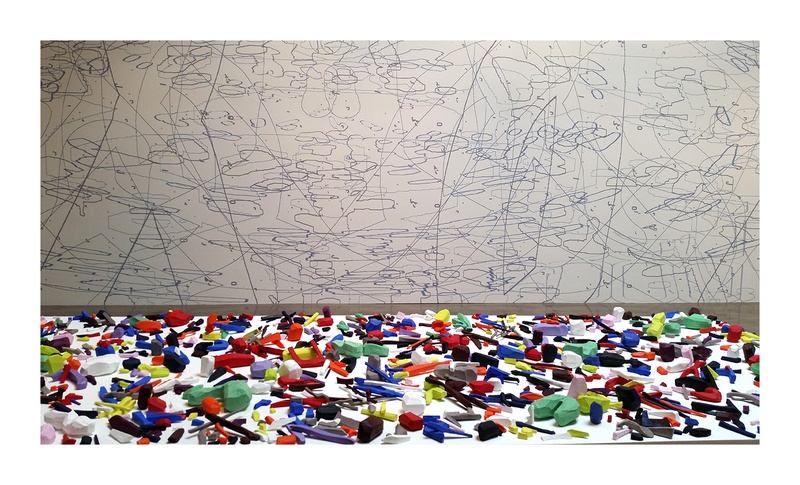 Following the opening of Amy Ellingson’s new exhibit, Iterations and Assertions, at the San Jose Institute for Contemporary Art (ICA), the San Francisco-based abstract artist gave an eloquent talk describing her work. Walking in the gallery, the viewer is struck by a collection of bold shapes and colors jutting from around the room. Already known for her paintings based on computer-generated graphics, Ellingson impressively extends her practice to include three-dimensional sculptures and a monochromatic mural. She begins by describing her complex painting process. A laptop serves as her sketchbook as she shapes and distorts colorful geometric fragments. The pieces are then manipulated and compiled, resulting in a multi-layered composition. Finally, she reproduces the digital image by laboriously painting it, layer by layer, in oil and encaustic onto the panels. With her new exhibition at the ICA, Ellingson describes the opportunity to move beyond her established painting repertoire. 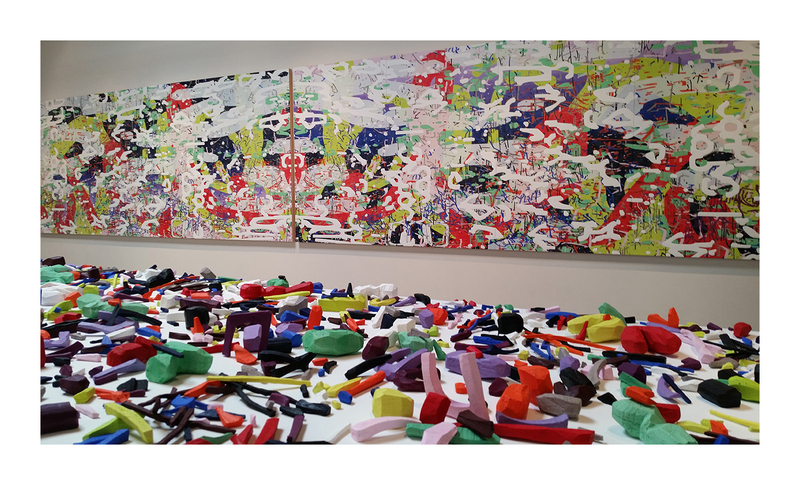 She recreates her myriad painted fragments as 17,000 individual encaustic pieces and places them on a long pedestal parallel to the panels. The three-dimensional pieces appear extracted from the painting, creating an impression of color transforming into substance. On the opposite wall, a monochromatic mural of similar dimensions halts this celebration of shapes and colors. Grayish, pixilated lines contour throughout the expansive, bare mural. Echoing the painted panel and sculptural installation, Ellingson describes how they are intended to imply a sculptural grid. Stripped of color and shape, the mural suggests a simple, authentic essence to the variegated exhibit. Examining the length and details of the installation inspires a contemplative interpretation, which is especially powerful in the parallel setting. 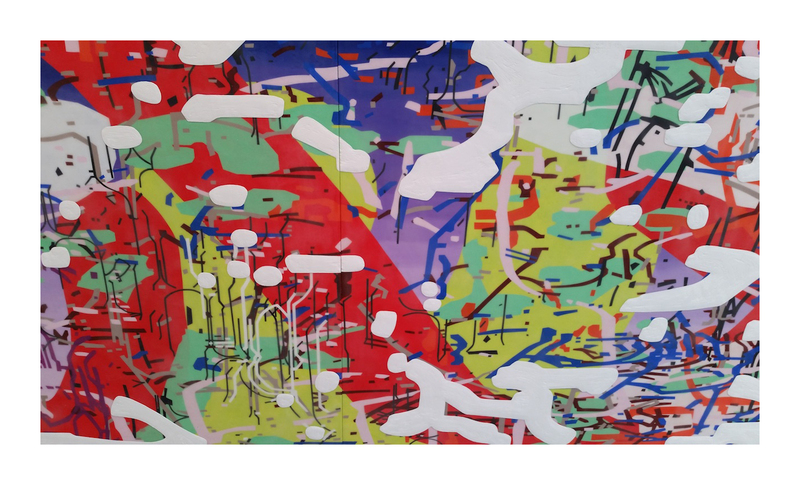 Ellingson’s iterations of her abstract elements cover a large range. In her sculpture she renders her abstract color elements three-dimensional while in her mural she completely eliminates her color into a system of contoured lines. This inspires associations ranging from archaeological findings to topological mappings. Walking along these three works, the viewer surveys the colors and shapes, weighing their dimensionality against their linearity as if moving along on a conveyor belt, taking in the marvelous procession of this multitude.